A family estate of 10 ha. The family has been present on Séguret since the French revolution and cultivates the vine for this time. Christian Vœux, oenologist, is a man grown in the vineyard who has been the winemaker of Château Mont-Redon during 25 years. He becomes in charge of this vineyard in 2006 and he create the Domaine de l’Amauve, at the retirement of his parents. Today, the Domaine de l’Amauve is producing One White wine and 4 cuvées in red.. All here is done in harmony with nature and in the respect of the environment. The culture of the vine is traditional there with work of the ground and limitation of the treatments according to the rules of reasoned agriculture. The limitation of the yield is natural in the old vines, however, in order to ensure a better regularity, the vineyard has wild grass growing one row every two. In the young vines, the wild grass does not have a sufficient effect, also, the green harvest is practiced like method of selection of the bunches and control of the yield. 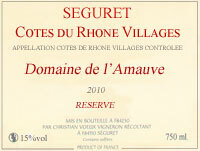 You will like this CDR-Village Séguret Réserve 2015, with prevailing of Grenache (80%), supplemented by Syrah, maturing 12 months in oak barrels and tanks, powerful, of a nice aromatic fullness, slightly spiced, combining suppleness and structure, a very successful, perfect wine on a chicken with spices or macaronis with the chanterelles. The 2009, with tannins quite molten but very present, complex, fleshy and scented in mouth, continue its evolution. 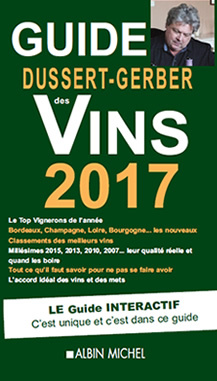 The CDR-Villages Laurances rouge 2016 is of color cherry steady, with the powerful undergrowth and cooked fruit aromas, with tannins firm and melted at the same time. All in delicacy, CDR-Villages La Daurèle blanc 2016, rich in bouquet (citrus fruits, hawthorn, almond…), all is a wine stops of them, all of structure and perfumes, molten and persistent, to uncork on rolls of salmon to the seafood. Taste the IGP de Vaucluse rouge 2016, Grenache and Syrah, where the prune and pepper intermingle, of structure harmonious, dense in mouth, quite robust, a wine of garnet-red color intense. White: 2016. Red : 2016, 2015, 2014.